Camping brings us back to our roots and favourite childhood memories. 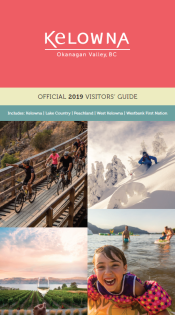 In Kelowna, you&apos;ll find camping in a range of settings from lakeside campgrounds, urban campsites, park like settings, mountain wilderness locations, and even agricultural properties like orchards! Load up the RV or tent and come on down - just don&apos;t forget to save some room in your camper for some of our delicious Okanagan wine. *Reservations strongly recommended for the months of July & August.